If you haven't heard dramatic story of the song "Åt Helvete För Sent" I'm gonna tell you now. In 2009 Mårten and Lina Eriksson with Sussie Päivirinta (from Lili and Susie) have written song "Åt helvete för sent" that was sung by Mathias Holmgren on initial version and sent to SVT with hope to get a ticket to Melodifestivalen and it's happened! 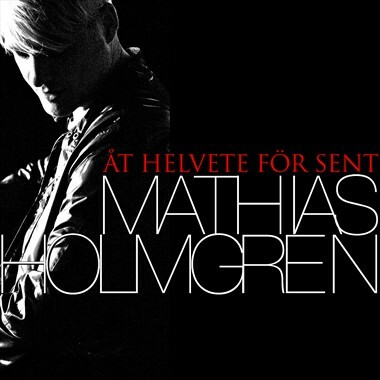 "Åt helvete för sent" was announced as qualifier and here started hottest dispute between songwriters and SVT. Songwriting team wanted Sara Löfgren to perform this song at Melodifestivalen when SVT wanted Rikard Wolff to be performer and as no one wanted to make compromise SVT has disqualified the song. Later when Rikard Wolff has appeared in interval-act with Dolph Lundgren he has left title of the song as ironic comment. Irony is cruel in this case as the contest has left song that could've been one of the best ones but thankfully it's got its own life without Melodifestivalen. Year ago Sara Löfgren presented her version of "Åt helvete för sent" that turned to be beautiful dramatic ballad with magic fairytale atmosphere and perfect Winter mood. Later when she has released it track was modernized with new Timbaland-smelling beat and now in a year we get version from Mathias Holmgren as separate release with initial arrangement. If we compare it with Sara's version it sounds less dramatic and lighter but not less touching with Mathias' sweet vocal. It's definitely great that this version is out and currently it's climbing iTunes-chart that is pretty good sign for new birth of this song.